When I was a kid, Rice Grader was like followings. Will be inclined to put something like piano wire lined, a method was selected to screen by passing on the brown rice. Now that the rotary Rice Grader is mainstream. Is inclined to place a cylindrical mesh, rotate it, making it flow like brown rice in it to screen. That it is very easy to handle taking place. I would like to describe the handling and use of these precautions. 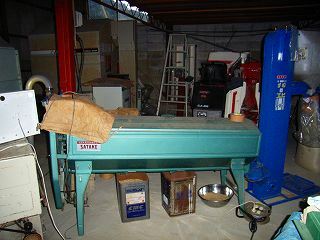 This photo is the rotary Satake rice-grader.It is just going to use brown rice sorting. After the polishing rise, Small-rice is removed by rice-grader. The brown rice from polishing machine is put in the rice grader. The brown rice that entered the rice grader passes in the rotating net. The power of this rotation is a motor of AC100V. Cracking immature rice and rice and small rice go out, and fall under the rice grader besides the net at that time. Small rice comes out from the hole in three places that is below. The small rice such as the smallest and inside and a little large small rice can be selected according to the left. Besides, it makes to the fertilizer or, it makes it to domestic animal's food though it can eat this a little large small rice. The brown rice that has come out from the rice grader is put in the meter at once. It makes it to the bag stuff while measuring the brown rice. It only makes it to the bag stuff because the meter of my home cannot be measured. Afterwards, it multiplies by the stone pulling out machine and a small stone in the brown rice is removed. This photograph is a net of the rotary type in the rice grader. It selects it in this through the brown rice. The sizes of eyes of this net are as follows. As for the sizes of eyes of sieve, this might be acceptable when eating 1.75mm as private rice. The sizes of eyes of sieve usually use this by 1.8mm. When it improves the quality by 1.85mm, the sizes of eyes of sieve use this. In addition, when rice with good quality is selected, the selection trunk of the reticulation of 1.9mm is used. There is an user, too, ..the selection trunk of 2.1-2.2mm.. when the paddy is selected moreover and it uses it for the seed paddy. The selection trunk of my home uses L net (1.85mm). Oiling and grease are injected into each part before it uses it. The moving part where the bearing is not used is oiled without fail. Otherwise, it rings with the key key. The switch is turned on first without fail before rice is put. When the selection work is done, the rotation part is never touched. The rice that remains on the inside is completely put out, and cleaned after use. Otherwise, the rat might enter the inside and the nest be done.